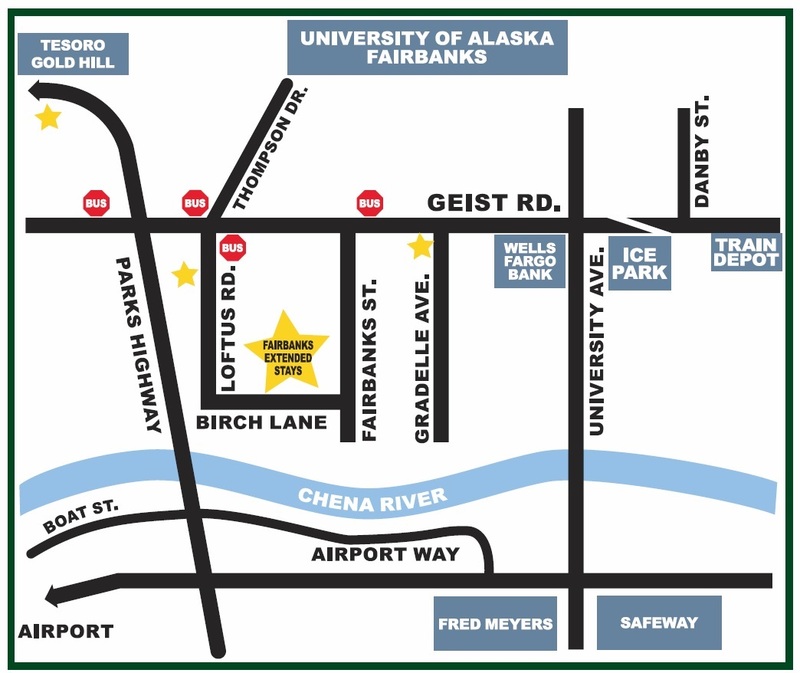 We are located on the west side of Fairbanks, just down the hill from the University of Alaska Fairbanks campus. Centrally located and easy to find, you will discover Fairbanks Extended Stays to be a great location for your business or leisure stay. Leaving the airport, the first exit is “Anchorage/Nenana/Denali Park.”Proceed about 1.5 miles to the “UAF/Geist Road” exit. Turn right onto “Geist.”The next intersection to the right is “Loftus,” just past the blue NAPA Auto Parts, where you’ll turn right. Directly behind NAPA is Fairbanks Extended Stays at 700 Loftus Road. The first sign as you come to Fairbanks is “University of Alaska.”Turn left onto “Geist Road.”The next intersection to the right is “Loftus,” just past the blue NAPA Auto Parts, where you’ll turn right. Directly behind NAPA is Fairbanks Extended Stays at 700 Loftus Road. Entering Fairbanks, take the exit from the Richardson that says “Denali Park.” Proceed approximately 3 miles until you see a sign that says “UAF/Geist Road” exit. Turn right onto “Geist.”The next intersection to the right is “Loftus,” just past the blue NAPA Auto Parts, where you’ll turn right. Directly behind NAPA is Fairbanks Extended Stays at 700 Loftus Road.